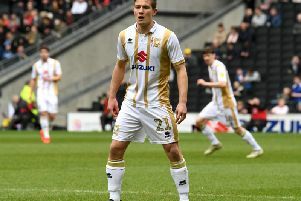 It was a day to forget for MK Dons as they dropped into the League 1 relegation zone on Saturday, after losing 2-1 to Northampton Town at Sixfields. Dons conceded two poor goals, first from John-Joe O'Toole and then from Chris Long, either side of an Alex Gilbey strike in the opening half. A lacklustre second half only sparked into life late in the day, with Northampton keeper Richard O'Donnell stepping up to deny the visitors, while Chuks Aneke came off the bench only to be sent off in stoppage time for his part in a scuffle after being fouled. The result means Dons are now 21st in the table, having dropped below Cobblers and AFC Wimbledon. New signing Marcus Tavernier was handed his first start for MK Dons after signing on Wednesday, while Ike Ugbo too returned to the side after missing out last weekend on Chelsea U21 duty. Having served his suspension, Osman Sow was back up front, while Peter Pawlett slotted in behind the front two. Chuks Aneke was named on the bench, with Conor McGrandles missing out for the first time since November. Having left the club on Wednesday to make room for Tavernier, Gboly Ariyibi, who signed for Northampton on Friday, was on the bench for Jimmy Floyd Hasselbaink's side. The stakes were high for both sides - victory for Northampton would mean they would jump Dons in the table, while anything else would keep them there. And despite a decent start from the visitors, it was the Cobblers who made the initial breakthrough. Joe Bunney skipped past Callum Brittain's challenge to pull the ball back low into the box, and John-Joe O'Toole managed to get enough on it to beat Lee Nicholls to give Northampton a 16th minute lead. It wouldn't last long though as Dons struck back immediately. In a similar passage of play, Osman Sow barged through Town skipper Ash Taylor to pull back to Alex Gilbey who hammered the ball past Richard O'Donnell on the half volley. After settling, Dons were unlucky not to be ahead, while Northampton had keeper O'Donnell to thank for keeping the scores all square. First, he dropped low to keep out Ike Ugbo's cross, but the ball popped up to Sow, but his header was somehow kept out by the keeper. Then, from the resultant corner, Brittain fired in from range, only for O'Donnell to fly across his line at full stretch to deny him. New signing Tavernier was enjoying a strong first appearance, seeing a lot of the ball and proving to be a lively outlet on the left-hand side. Dons were probably edging the run of play, but it was Northampton who struck four minutes before half time, with Sam Hoskins pulling it back for Chris Long to steer it past Nicholls to put the home side 2-1 up. The second half had much less of the zip seen in the first. Northampton remained compact, but passed nicely through the thirds, while Dons looked rushed as they desperately sought a way out of the relegation zone. Chances were few and far between at both ends, but Northampton had the better of them, with substitute Hildeberto Pereira drawing a save from Nicholls, while Peter Pawlett sending one wide at the other end was all Dons had to write home about. Sporadic chants for the manager's head were heard from the 1,210 away fans as Dons struggled to make any headway, while the arrival of Gboly Ariyibi for the home side only added to the story line as he almost undid his old team-mates late in the day, only to see his dangerous cross cut out by Ebanks-Landell. The late introduction of Kieran Agard sparked a Dons revival as they poured forwards, only to be denied by O'Donnell as George Williams headed powerfully on goal, substitute Chuks Aneke tested the keeper too, while Tavernier fizzed one over the top. The afternoon would go from bad to worse though when, deep into stoppage time, Aneke was fouled on the edge of the box, sparking a fight in the D, with referee Brett Huxtable sending Aneke off for his part in it. While O'Donnell pulled off another wonderful save to deny Tavernier's eventual free kick, it was fruitless for Dons, who drop into the relegation zone as a result of the defeat.